How Does a Nebulizer Diffuser Work? Essential oils have become extremely popular in recently, but they are certainly not new. These powerful concentrated substances come with a great deal of ancient history with years and years of proof of their effectiveness behind them. Today, essential oils are easily located, affordable, and readily available for use in your home, at work, and on the go. If you’re trying to decide about the best nebulizing diffuser, we’ve got you covered! We’ve done all of the work for you to be able to determine which nebulizer diffuser offers the features, benefits, functionality, and style that you need to use your essential oils to their highest potential. For therapeutic benefits, as well as simply enjoying the scent, a diffuser is one of the best ways to distribute essential oils into your home or workplace. The purest, strongest form of diffusing essential oils works through a waterless diffuser, otherwise known as a nebulizer essential oil diffuser. 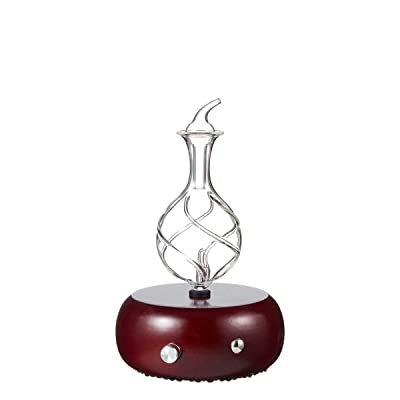 This allows you to diffuse without subjecting your oils to heat that can compromise their integrity. Also, rather than diluting your essential oils with water as when using an ultrasonic diffuser, a nebulizer diffuser allows your essential oils to come directly to you through the air. Using a nebulizer diffuser for essential oils can do so much more than simply make your room smell great. It does that, of course! But in addition to the incredible scent, essential oils provide many great therapeutic benefits by changing your mood, purifying the air, and supporting the overall health and happiness of you and your family. It can change the way you and your family think and feel in a very short amount of time. An essential oil nebulizer diffuser will consist of a base (typically wood), reservoir, glass chamber, glass tubing, and a nozzle tube. A source of power (electricity or battery) causes the air to pump through the machine. Scientifically, the nebulizer diffuser work on the Bernoulli principle. This uses the theory of fluid dynamics to force an air current through a small tube where pressure differences create a sort of suction, causing the essential oils kept in a separate glass tube to rise upwards within the air. 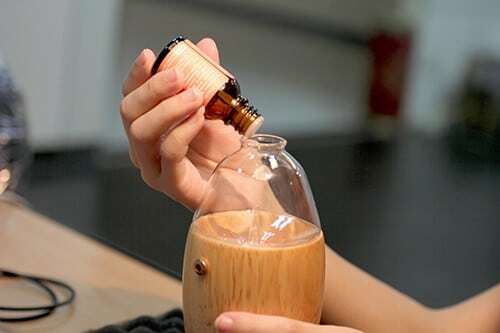 As the oil rises, a pressurized stream of air causes the essential oil to atomize into micro-particles, filling the glass reservoir and eventually rising up out of the glass cap through a waterless mist and into the room. 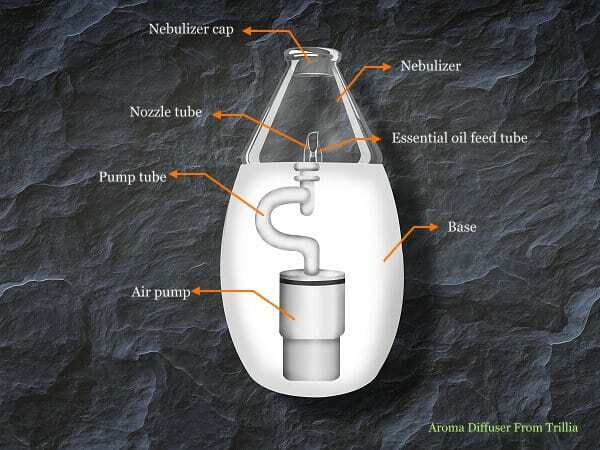 At this point, any remaining essential oil falls to the bottom of the diffuser and the cycle is repeated until all of the oil has been diffused into the air or until the machine is shut off manually. 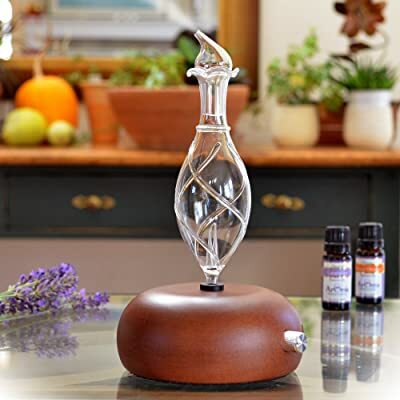 Of course, it is critical to make sure that you only use 100% pure essential oils in your nebulizing diffuser in order to keep it functioning properly and to gain the most benefits. “Fragrance oils” that are not pure will not be effective and may even create clogs or possibly ruin your beautiful nebulizer diffuser. Choosing which nebulizer diffuser is best for you means asking a few questions to determine your specific needs. This will then lead you to decide which product is best for your personal use. Which room to I plan to use my diffuser in most? How much control do I need over the mist concentration? How long do I want my diffuser to run? What type of power source is best for me? Once you’ve answered these questions for yourself, you can then consider how each of the following factors will affect your choice of the best diffusers. Different brands and models of nebulizer diffusers have different ranges for room coverage, from around 300 square feet to over 1000 square feet. When you want to use a nebulizer diffuser for a large room, it’s important to purchase a model that is made for the size of room that you need. The manufacturer’s specifications should give you the information you need for the size of the room you can expect a model to cater to. Being able to control the output for your nebulizer diffuser can be an important factor for some people. Some evidence does exist that intermittent short bursts of essential oil mist may be more effective than a continuous mist—especially when it comes to killing germs. Most diffusers offer an intermittent mist instead of a steady release. Certain nebulizer diffuser models also offer an adjustable mist setting so that the fan runs harder to increase the amount of mist generated (and potentially the amount of coverage as well). Settings may range from very high to very low and this will affect the strength of the oils in the air. Of course, an increased output will likely result in an increase in noise from the fan, which is a separate consideration. It is important to remember that the natural therapeutic properties of essential oils are working in the air you breathe continuously. Essential oils are powerful and can impact your body in negative ways if you get too much of them. For instance, a bit of lavender can help with a headache, but too much can actually cause a headache. This means that you should be following the run time instructions for your nebulizer diffuser and not adding more time to it just because you like the smells. Most diffusers run between two hours and four hours at a time, on intermittent mist settings. Some motors in nebulizer diffusers make more noise than others, so it can be helpful to read reviews from those who comment on the noise. If you are planning to use your diffuser in the bedroom, it may be important that it be very quiet. One note, however, is that the hum of the motor typically acts as a “white noise” that becomes unnoticeable as it usually blends into the background. Nebulizer diffusers are designed to run for a short period of time and then shut off. Most timers will run through for a few cycles before shutting off completely. Unlike an ultrasonic diffuser, however, a nebulizer that doesn’t have a time will usually keep running into it is turned off manually. Because of this, it is important to be sure that you check your essential oil levels so that the reservoir doesn’t become empty. Some nebulizer diffusers plug into an outlet in the wall and run strictly on electricity. Others can become a bit more portable when they are made to be cordless and run with a battery pack. Still others have the option of plugging into a USB charging port for convenience when travelling. The products we have featured below all make use of 110V/220V wall plugs. Certain nebulizer diffusers can be a bit fussy to clean, simply because they are so fragile and made with glass. Typically cleaning a diffuser requires the use of rubbing alcohol and should be practiced regularly so that the tubing inside the nebulizer diffuser does not become clogged. Keeping up with maintenance is important in order to keep your diffuser functioning well. Here we feature the best 5 Nebulizer Diffusers we can find on the market today. We’ll offer product descriptions, pros and cons, tell you how actual product users feel about the product, and give you a final verdict. People who own the ArOmis Wood Glass Aromatherapy Diffuser love it for a variety of reasons! From the beauty of the hand-blown glass to the simplicity of the easy-to-read instructions, this diffuser offers a “heavenly” scent that comes out almost instantaneously. All natural glass bottle and wood base means this unit has no plastics or artificial materials to come into contact with the oils. Adjustable aroma intensity to fill up to a 30’ x 30’ room. Built in timer works on for 10 minutes, then off for 10 minutes and with automatically shut off after 4 hours. One year warranty for parts, replacement, and labor. When the oil begins to run low in the reservoir, the machine has a tendency to make a rattling noise. Some people might also prefer to have more control over the timer, allowing for less scent or making it shut off automatically after only one hour instead of four. Fragile and easily breakable. 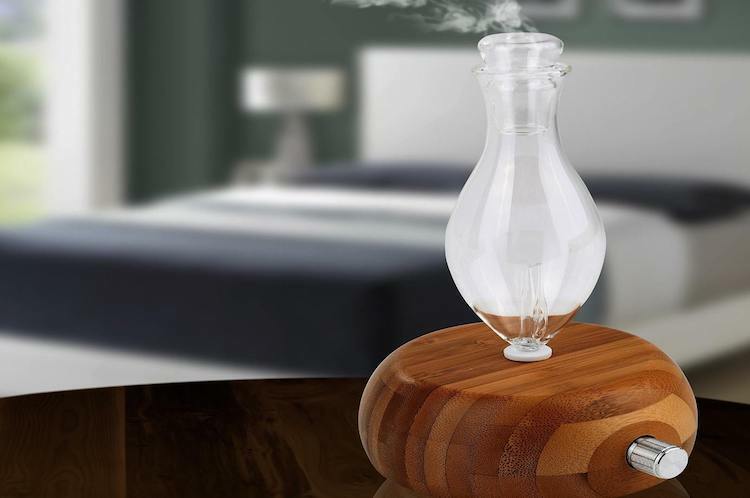 For a slightly lower cost than most, this nebulizer diffuser offers a classic beauty and design with elegant blown glass and long running time for use in the living room or bedroom. 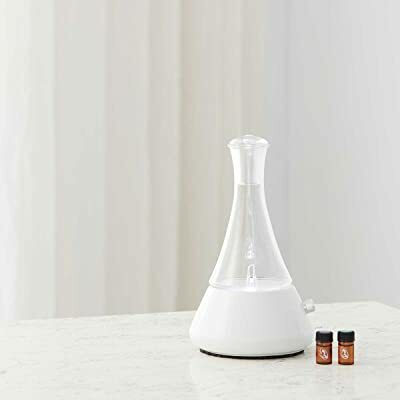 Reviewers who own this nebulizer diffuser often say that it is the best diffuser they have ever used—even when they own several of them. This one is particularly enjoyed because of the classic style it carries, making it seem much like a work of art than a powerful essential oil machine. Made from 100% whole plantation hardwood and individually handmade blown glass. Convenient operating usage cycle runs for two minutes, off for one minute, and then repeat for two hours until automatically shutting off. Special insulation results in whisper quiet running so that only a slight humming sound is heard. Tends to clog if not carefully cleaned and maintained on a regular basis. Glass is extremely fragile and may be easily broken if not handled carefully—not great for use around children or pets for this reason. For a person who wants quality output with adjustable mist and a luxurious design that resembles antique art, for use in the dining room or living room. This nebulizer diffuser is well-loved by the people who own it. Many of them, in fact, will come back to purchase another one for a friend—or just to have one in every room of the house! It works simply, efficiently, and is easy to maintain and clean. Attractive with a simple design, this nebulizer is naturally made from 100% plantation hardwood. Intermittent operating cycle runs for one minute, then off for two minutes, repeating for two hours and then automatically shutting off. Mist is adjustable from low to high and motor is whisper quiet. Clogging may occur if not properly cleaned and maintained. Easily breakable, fragile glass so not best when used around children or pets. 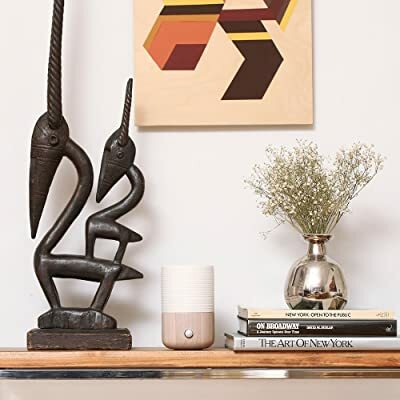 For the person who loves simple design lines, modern looking hardwood and high-quality output this diffuser will fit perfectly in the kitchen or bedroom. People who use this nebulizer often fall in love with it right away! The sleek, minimalist style, quiet running, and effective output make this ceramic diffuser an excellent purchase. Useful for a variety of therapeutic purposes, this diffuser is high-quality and easy to use. One-of-a-kind, uniquely handcrafted ceramic base lends a sleek look to this nebulizer with hand blown glass reservoir. With 800 square feet of coverage, this diffuser operates for 2 minutes on/one minute off cycle, then automatically shuts off after 2 hours. Also has a soft-white LED mood light that can be turned on or off based on preference and usage. Runs very quietly, even when adjusted to high mist output. Ceramic base can sometimes make noise when glass hits it. Glass may also be very fragile and must be handled carefully. Slightly more expensive than other models with a wood base. For the discerning minimalist who is looking for a high quality diffuser with sleek, white elegance and simplicity goes nicely in the kitchen or office. Customers who own this diffuser have tons of good things to say about it! The experience is “pure, potent and therapeutic”. Useful for massage therapists because of mood enhancing lights that pulsate along with breathing rhythms. Highly recommended by home-users as well as professionals, this diffuser is well worth the cost and is also absolutely beautiful. Made of ceramic and oak hardwood, this diffuser may be more durable than the usual hand-blown glass types. Comes with LED meditation ambient light that can be switched on/off/or to following breathing pattern for meditation. Two glass reservoirs makes changing essential oils simple and easy with less cleaning needed. Intermittent cycle of two minutes on, then one minute off. Easy clean with hot water and a soft cloth. Some reports of noisiness when running. Minimalistic design to fit with modern décor. 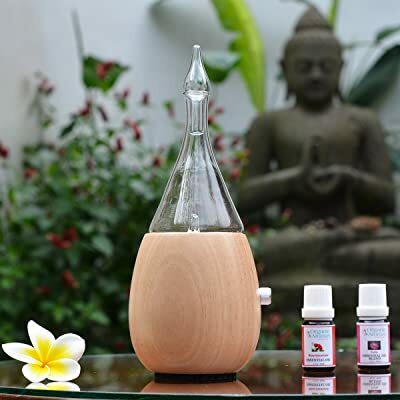 For the person looking for a compact, modern look with superb output and useful for meditation, this diffuser is simple to use, makes changing oils as easy as a dream, and works well in the bedroom or massage therapy room. Perfect for a person who wants to cover a large room with essential oils and get the therapeutic benefits all throughout the house or working space. If you’re purchasing your first nebulizer diffuser and you are not sure what to expect, be prepared because it could change your life! Really and truly, diffusing essential oils into your home or office could change your physical health, your emotional well-being, your amount of work productivity, and even improve your relationships. Once you’ve begun harnessing the power and strength of pure essential oils through your nebulizer diffuser, you’ll wonder how you ever lived without one!